Platinum Party Bus Limos provides you with dedicated party bus limousine services in Guelph and the surrounding areas, by providing you with reliable limousine drivers that are familiar with the areas and surrounding areas, and a nice variety of choices of limo fleet to choose from. If you are planning on a wedding limo rental in Guelph and are looking for a larger limo to cater to the large wedding party you have along with your family, then you should consider a limo bus. Our choices of party bus limos range in 18 – 26 passengers in size, and go even larger with the larger luxurious limo buses. Those range from 30 passengers up to 50 passengers in size. Other great options for limo buses include renting a party bus limo for a high school prom, a night out with family and friends and casino limousine ride. Whatever it is that you are looking for from a party bus limo rental, trust the experience at Platinum Party Bus Limos, where we have seen serving the Guelph area for many years. Contact us today to reserve a party bus limo. 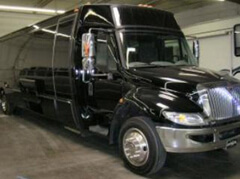 It is never too early to inquire about availability as our party bus limos can be rented quickly. Call and speak to a booking agent who can answer all of your questions and assist in helping you choose the right party bus limo from Platinum Party Bus Limos.